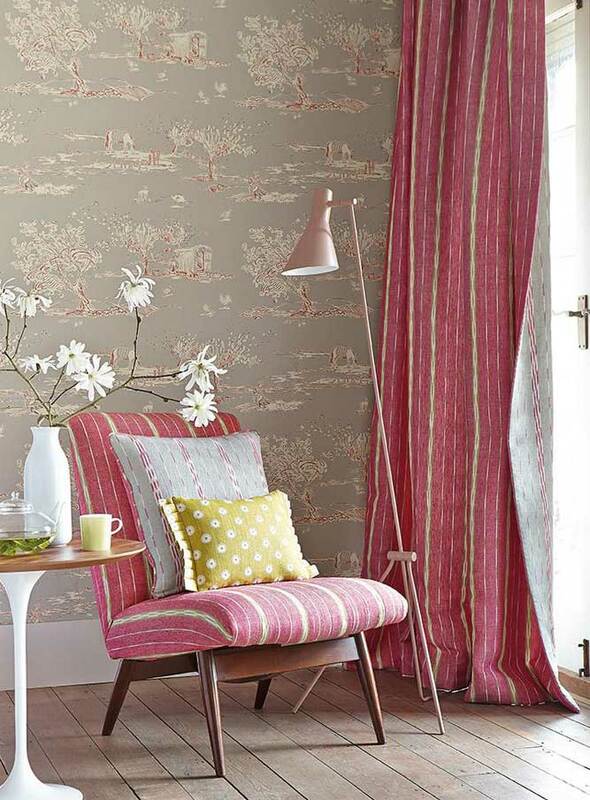 Vanessa Arbuthnott has turned a few of her most popular fabrics into a wallpaper collection. Offering five designs in 17 colourways, the wall coverings and wallpapers are printed in the UK using acrylic inks, which are environmentally safe and have long lasting colourfastness. Pictured above is For the Love of Rose, a modern take on a traditional toile theme, with scenes depicting a gypsy caravan, washing line-drying in the summer sun and Vanessa’s goats, geese and chickens – even her whippet Ruby! In addition to the wall coverings, a new woven range encompasses four subtle yet striking designs, each in two different colourways, which coordinate with the current Vanessa Arbuthnott printed and plain fabrics. The ‘Scandinavian Wovens’ mark a new departure for Vanessa, as hitherto she has concentrated primarily on printed fabrics, complemented by a selection of organic plain weaves. The new Vanessa Arbuthnott woven range is produced from 100% eco-friendly flax. These fabrics have been pre-washed to make a soft, resilient fabric, ideal for curtains and still durable enough to be used in upholstery. The particular beauty of the weaves is that they are equally attractive on either side and, as a result, can make stunning unlined curtains or blinds.